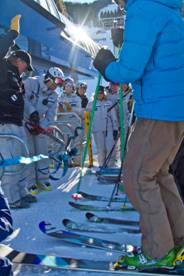 Vail cranked up its new six-passenger, high-speed chairlift out of Mid-Vail Wednesday, expanding its skiable terrain to 650 acres. The new Mountain Top Express Lift (Chair 4) increases the uphill capacity 33 percent to 3,600 snow riders per hour, the same capacity of Gondola One, which opened last season and is the main Vail Village portal to Mid-Vail. 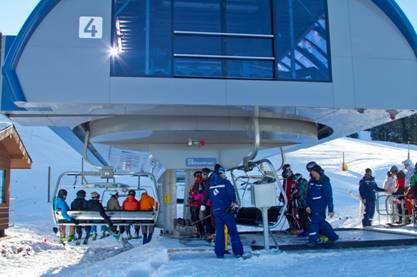 Chair 4 takes snow riders on to the top of the mountain and provides access to the Back Bowls and Blue Sky Basin. The new Chair 4 features loading gates with a right angle loading conveyor system, which reduces the number of lift stops and slow-downs and increases the overall efficiency of the lift. Skiers and snowboarders catch first chair on Vail’s new Mountain Top Express Lift (Vail Resorts photo). Beaver Creek opened with nearly 500 acres of skiable terrain on Wednesday. Season pass restrictions will be in effect at Vail and Beaver Creek over the Thanksgiving holiday weekend. The Epic Local Pass, Merchant Pass and other passes such as Guest Fee and Community Relations passes are restricted on Friday and Saturday, Nov. 29-30. Restricted pass holders may ski or snowboard Friday and Saturday by showing their pass and purchasing a discounted lift ticket at any ticket window (rates vary depending on pass type). Restricted season pass holders with Lift Charge will automatically be charged the applicable rate on their credit card if their restricted pass is scanned at Vail and Beaver Creek Friday and Saturday. Chris Jarnot, senior vice president and chief operating officer of Vail Mountain, cuts the ribbon before first chair on the new six-passenger Mountain Top Express Lift (Vail Resorts photo). For more information, call the Vail Mountain Information Center at (970) SKI-VAIL (754-8245) or the Beaver Creek Information Center at (970) 754-4636. Opensnow.com is calling for light snow along Interstate 70 Saturday night into Sunday, with a bigger storm in the forecast for Tuesday night through the end of the week.